That’s right! 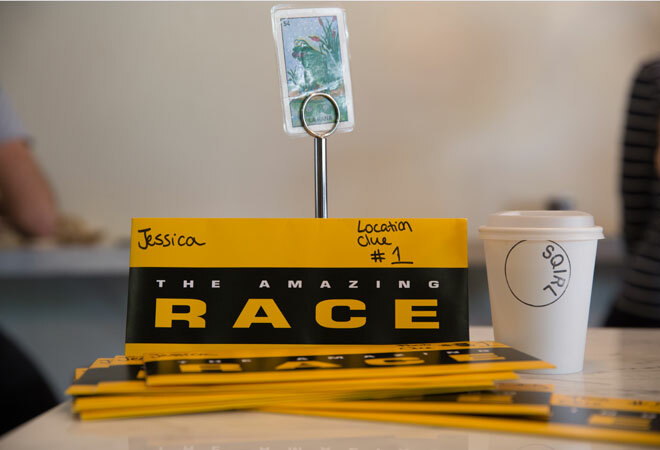 When we spoke with Elise Doganieri and Bertram Van Munster, co-creators of CBS’s The Amazing Race, we asked if perhaps they had any of those official “Amazing Race” yellow clue envelopes lying around. They did! We were the first ones to ask, apparently. Editor-in-chief Mary Melton (an obsessive fan of the show) currently has one pinned to her office wall. We print—just love it—but sometimes its physical constraints means that some great stuff winds up on the magazine’s cutting room floor. While readers get to see the clues that led contestants to various ethnic restaurants in the November issue story, we also made them guess what signature dish to order at each spot. Those clues didn’t make the cut, but we thought you should know. The contestants were originally supposed to finish the day with a scoop of creamy gelato from the Bulgarini cart at the Grand Central Market. But the cart was absent on race day—just our luck. We scrambled to come up with a second dessert option, and settled on the banana pudding at Horse Thief BBQ. Eating the fruit is one thing she typically won’t do. Yet, she put down that cup of banana pudding like a champ! ‘Atta girl. See the whole challenge (and find out who won!) in this month’s issue of Los Angeles magazine.